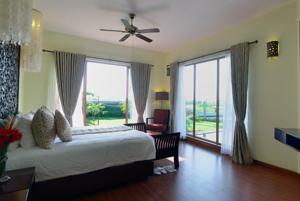 Set amidst a natural landscape, The Windflower Resort & Spa is located in Pondicherry. It features an outdoor swimming pool, a restaurant and standalone villas that overlook the garden. Elegant villas feature modern interiors, floor-to-ceiling windows and wooden flooring. Each well-appointed unit is equipped with a cable TV, cosy seating area and private bathroom with a shower. Bathrobes and a hairdryer are included. Windflower Resort is 8 km from Vinayaga Temple, Pondicherry Railway Station and Pondicherry Bus Station. Guests can practice yoga, or enjoy relaxing massages and body treatments at the spa. Meeting and banquet facilities are also available upon request. Free Wi-Fi is provided in public areas. The restaurant serves a fine selection of local and international fresh seafood dishes. Free! One child under 5 years stays free of charge when using existing beds. One older child or adult is charged INR 1400 per night and person in an extra bed. Maximum capacity of extra beds in a room is 1. Any type of extra bed or child's cot/crib is upon request and needs to be confirmed by the hotel. Supplements will not be calculated automatically in the total costs and have to be paid separately in the hotel. American Express, Visa, Euro/Mastercard, Maestro The hotel reserves the right to pre-authorise credit cards prior to arrival.